What happens when you mix a great classic British soap house’s cream and an American Artisans soap ? Some really amazing stuff ! I know we call these Shaves of the day, but as of late I have been trying to push the envelope trying new combinations, and today was one of those days. Now I wasn’t sky diving or, going face first down the Flume; we are talking about super-lathering again, but to me this is just as exciting as this may be a combo you may want to try, it is that good ! 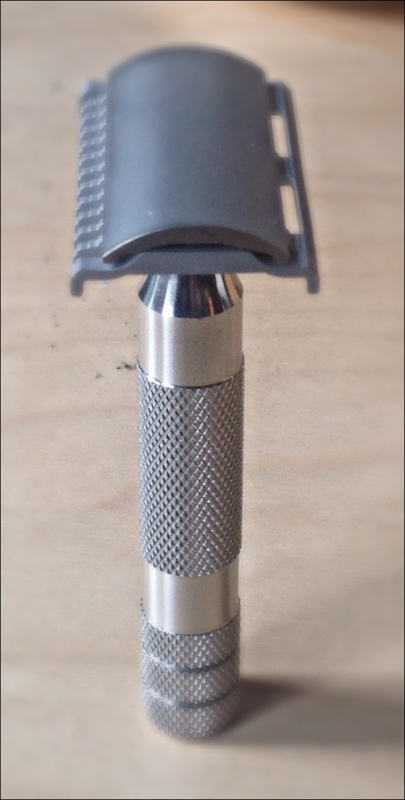 Today I decided to use my Ikon modular OSS mounted on the 316L stainless steel bulldog handle that came with the open comb head. Recently a member of the WSR had asked about the OSS head, and I wanted to reply, but for once I did not know exactly how to reply. Traditionally I would say for multiple passes the open comb is great initially for the reduction pass followed by the closed comb for the remainder. Today I would not have said that. I did 100% on the closed comb side. I did not need a super aggressive shave so I stayed to the one side . 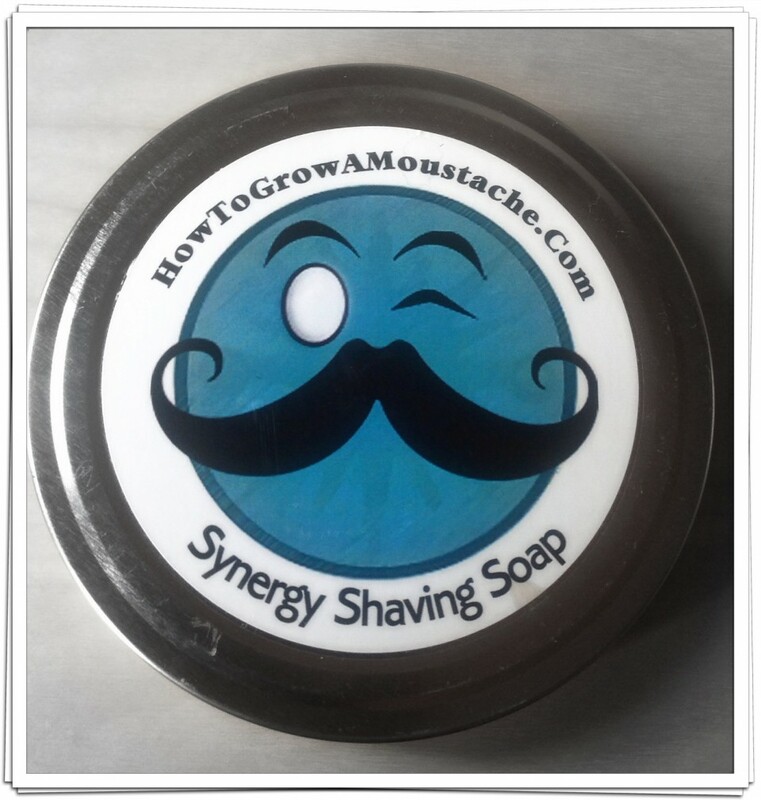 I did not find this to be a hindrance at all I found that I could get about 3 passes between rinsing, and it did not to my internal clock extend the shave at all. I to be honest found the Ikon to be quiet pleasurable to use. I will say though with a heavier growth than I had today I would have started on the Open Comb side. I paired the Ikon with the Voskhod now on use 9 !! not a drop of a problem, I average 10 shaves, but we are going to see if we can shoot for 12 just out of again a “trial”. now this is where some real magical stuff happened ! It came to me last night while just thinking about certain scents that would compliment each other. This was a result of a great Q&A with Frances from Petal Pushers Fancies who made me think a bit about how scents for soaps are made. The jist of what was said was a lot of bad soaps happened before the good soap was finally made…. in other words trial and error. Now I do not have the patience Frances has, but I do have a huge soap and cream den ! So while I was up thinking it came to me I am focusing on Geo F. Trumpers “Almond” and I thought “I wonder how a combination of GFT “Almond” and Synergy “Cavendish” would be ? So long story short it happened today. All I can say is I cannot believe how perfect this super lather was ! GFT “Almond” is a strongly scented and sweeter almond scent and “Cavendish” is also a strongly scented soap. Neither of which dominated the other nor, did it feel like there was a struggle for scent dominance. The lather had the best of both the cream, and the soap; super slick, massive cushion, and unique and smooth in aroma that stayed throughout and even after the shave. 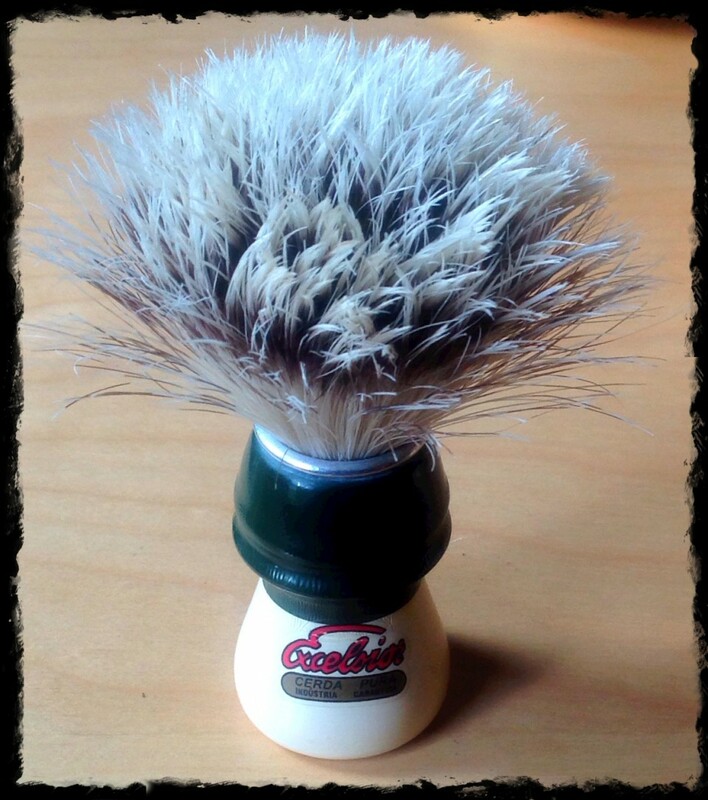 I made the magic happen with my Semogue 1305 which is my traditional “Cavendish” brush ! Great combination that I cannot recommend highly enough, just remember to use a sweet almond like GFT not a bitter one like Cella … I’m not sure about that one. 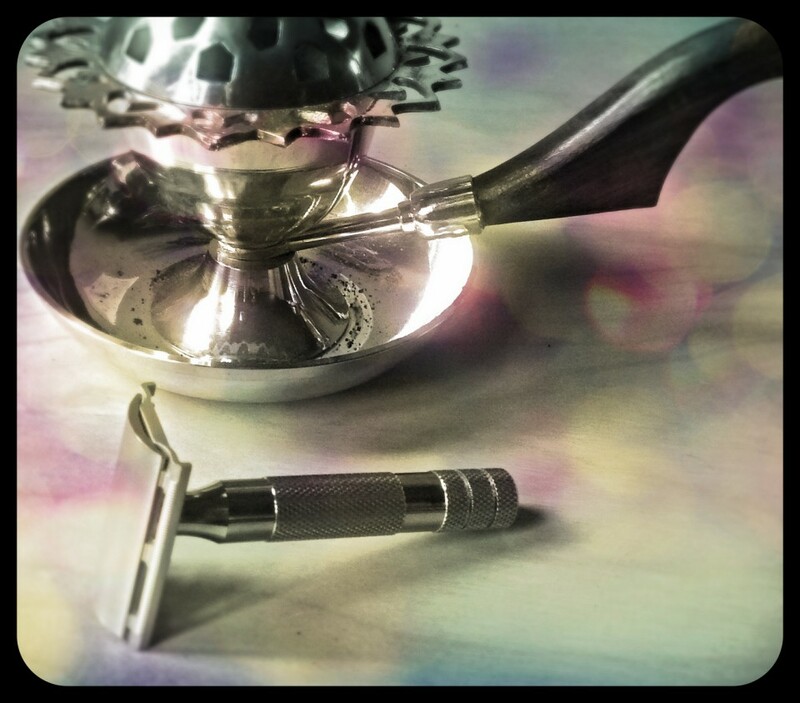 To end this great shave full of “trials” why would I end any differently ? I did the classic cold water rinse, and Shavex alum rub. I had zero irritation and great feedback. This really was a great shave. 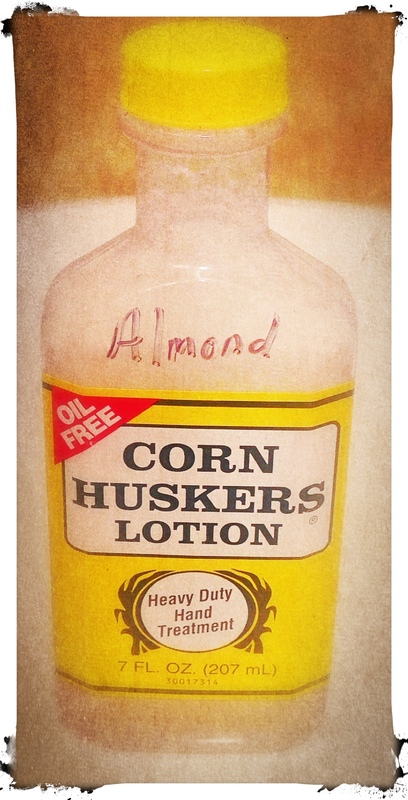 I then moved over to a more traditional toner and used the HTGAM alcohol free “Cavendish” after shave, but after drying I mixed a homemade Corn Huskers lotion and Almond essential oil mixture with the HTGAM “Cavendish” lotion and it made again a really great aroma where both the almond and the Cavendish scent stood out wonderfully. The mixture left my face silky smooth feeling and ultra moisturized. Now would I go through this effort every time I use Synergy “Cavendish”, but it sure will be a nice treat every so often and now that I know this combination works, it gives me an option I didn’t have yesterday. So that ends my SOTD so I learned today that I can just use one side of the Ikon OSS without any problems, that GFT “Almond” and Synergy “Cavendish” make a GREAT super-lather and finally a similar combination of CHL w/ almond EO and HTGAM “Cavendish” lotion also make for an outstanding after shave.